Few tools are as ubiquitous in the translation world as Google: we use it all the time to search for the meaning of obscure terms. But Google searches can do much more than that: they can help us determine which of several candidate translations is the best, or the most used (the two things may not coincide) in our target language. For example a legal translation I'm doing at the moment mentions "buyer's remorse". According to Wikipedia, "Buyer's remorse" is "the sense of regret after having made a purchase. It is frequently associated with the purchase of an expensive item" - something, I'm sure, most of us have experienced at some time or another. The meaning is clear, but... how should we translate this into Italian? A few candidate terms come to mind: "rimorso", "pentimento", and "ripensamento" "del compratore" or "dell'acquirente". By performing an advanced search in Google, we can restrict our searches to only sites in Italian and/or sites from Italy. Now things are clearer: "pentimento" (which was the translation that first came to my mind) is clearly out: too few hits in Italian pages. The two "rimorso" entries are plausible candidates, but, in my opinion, rimorso is not the most appropriate word here: it's almost a false friend in this context – still, they may be what’s used in Italy, so they remain as term candidates. Of the final pair of candidates, "ripensamento del compratore" is clearly used much less than "ripensamento dell'acquirente", so this latter now becomes my leading candidate. There is still more to do, of course: verify that my candidate term is in fact used in contexts similar to the document I'm translating, and that, in this particular context, one of the other candidate terms is not better or more appropriate. So this time I search again for "rimorso del compratore", for "rimorso dell'acquirente", and for "ripensamento dell'acquirente", this time together with another word ("immobile", in this case) to help restrict the context. The latter clearly seems a strong candidate translation. Of course, frequency of use is not the only criterion to use when searching for a term, but it's a good start. Frequency of use is very useful in Google: in this specific case "ripensamento" is the closer meaning, also known as "clausola di recesso"
This part is very important to understand: "translations is the best, or the most used" - Google shows you which translation term is most used, but that does not necessarily mean it is the best. If that were the case, Google translate would've been more accurate, and it's not. In your example, you found the last translation to have the most hits, but you don't know the context in which Google found it. While this is a good idea, I wouldn't rely on it, especially in the case of highly technical speech, like legal. Of course you don't just accept a term candidate because you find it has the most hits: you do have to verify how it is used in context. 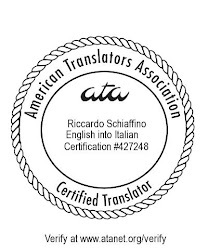 So a careful translator will check various hits for the main term candidates to see whether the candidate term is good or not, and that may depend on many different things, especially the reliability of the sites where the candidate term is found.